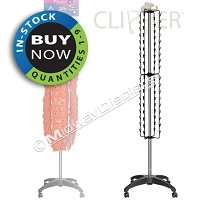 Floor, Counter Top and Hanging Clipper Merchandisers to Buy Now! 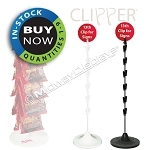 Our Clipper Displays are cost effective and ship quick in small quantities! 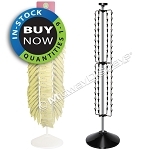 This Online Store offers our best selling Clipper styles to fulfill all your presentation needs. 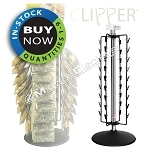 From our 60 Clipper designed to house your big bagged products with its generous clip spacing, our Space-saving 72 Clipper that's perfect for C-Stores and Deli's taking up only 16 square inches of tight retail floor space, or our work horse... the High Capacity 108 Clipper Spinner for high volume sales. 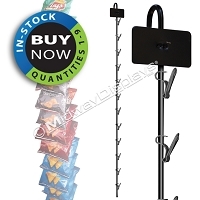 Don't forget our counter-top and hanging clip merchandisers for that last minute impulse sale at the checkout counter! We also offer our 72 Clipper with a castered base for mobility, allowing you to quickly reset your store to be timely with bakery & snack products! 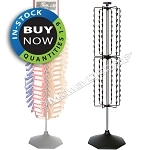 You'll love our patented Fold Flat Design that SNAPS Open for easy assembly with no tools! They are all proudly made in the USA! All our IN-Stock | BUY-Now Merchandisers are available for immediate Purchase to ship quick in small quantities.